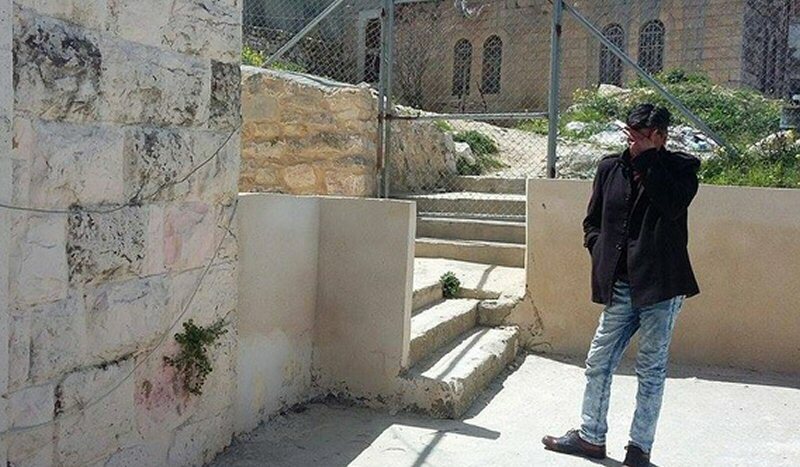 Imad Abu Shamsiya stands in front of an Israeli military barrier in occupied Hebron. Photo credit: Palestinian Center for Human Rights. Two years since filming Israeli soldier Elor Azaria execute Abed Fattah al-Sharif, Shamsieh worries that soon there will be no Palestinians left in occupied Hebron. On March 24, 2015, Imad Abu Shamsieh, a Palestinian resident of Tel Rumeida, filmed the execution of 21-year-old Abdel Fattah al-Sharif by Israeli occupation soldier, Elor Azaria. The video, shared with the media by the human rights group, B’Tselem, provoked outrage from around the world, demanding justice on behalf of the murdered al-Sharif. In August, nearly two and a half years after the murder, Christian Peacemaker Teams (CPT) had the chance to sit down with Imad Abu Shamsieh to learn what, if anything, has changed in the besieged neighborhood of Tel Rumeida. “You cannot call this a life,” he continues “there is no freedom. Our homes are like a prison, where no one is safe, even inside.” There are frequent home invasions during the night and early hours of the morning; any soldier for any reason can invade a Palestinian’s home. They need no special permits, no permission and no warrant. The situation is particularly bad for children. Soldiers and settlers regularly attack and harass children while they play in the streets, often breaking their toys. Shamsieh recounts an incident shortly after he bought his son a new bicycle; a settler child took it from his hands saying that it was his. The family lodged a complaint with the police, but the bike was never returned to its rightful owner. Even trying to enter the neighborhood via one of the four checkpoints surrounding the neighborhood is a herculean task. In 2015 the neighborhood was declared a closed military zone, where only residents – who must be checked against a list – may enter. Despite the list, many residents are denied passage through the checkpoints, often with no official reason for the denial of some and the allowance of others. Ten names on this list are harassed more than others, subject to going through metal detectors multiple times despite whether they sound. The reason why these ten have been singled out? Shamsieh proposes that it is because they are activists who speak with foreigners and the media about what is happening in the small neighborhood. Shamsieh, himself, suffers under restrictions and harassment; he is not allowed to stand on the rooftops of his own home, he is subject to constant harassment due to his frequent contact with the media and has even had his home’s water tanks poisoned by settlers. This essay was published by Christian Peacemaker Teams – Palestine and edited for aicnews.org.